Rambo III is easily the weaker of the original three films of the series with the action not quite measuring up to the first two and even Stallone felt a bit wary with his performance that didn’t feel very energetic. Still, it was moderately entertaining. Plot Synopsis: Col. Sam Trautman (RICHARD CRENNA) travels to Thailand, hoping to convince veteran John Rambo (SYLVESTER STALLONE) to accompany him on a training mission in Afghanistan. When Rambo refuses, Trautman decides to go alone — but, while trying to help the mujahedeen, Trautman is captured by a ruthless Russian colonel (MARC DE JONGE) who submits him to torture. 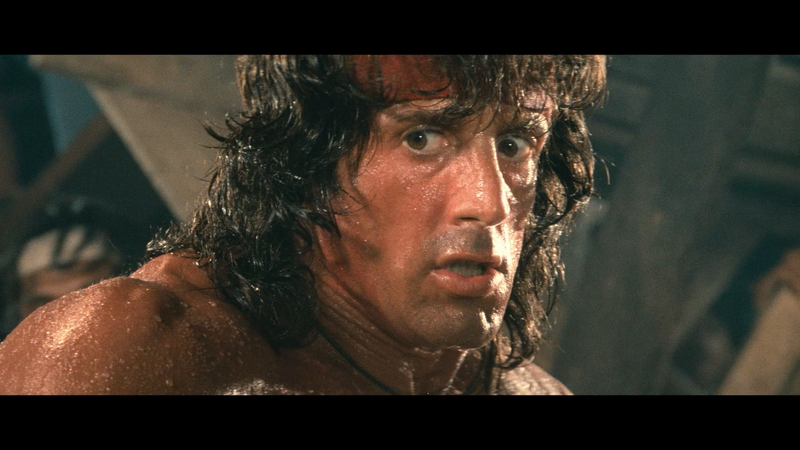 Hearing the news, Rambo volunteers for a top secret undercover mission to rescue his longtime friend. 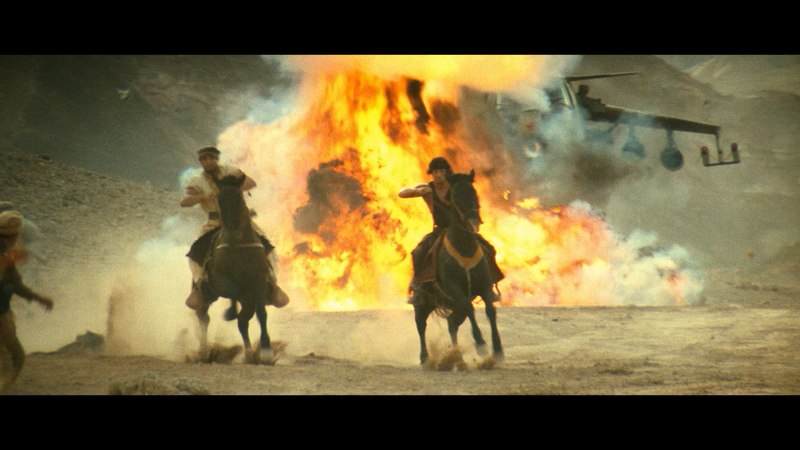 Quick Hit Review: This third film, Rambo III, in the series, and saying this having never watched Rambo, is by far the weakest. The performance from Stallone was fine I suppose but he came across more weary than anything and not weary in terms of his Rambo character tired of fighting either. The set pieces aren’t quite as impressive either compared with First Blood Part II and even the action sequences not as exciting, though still nice to see some of the practical effects work done. 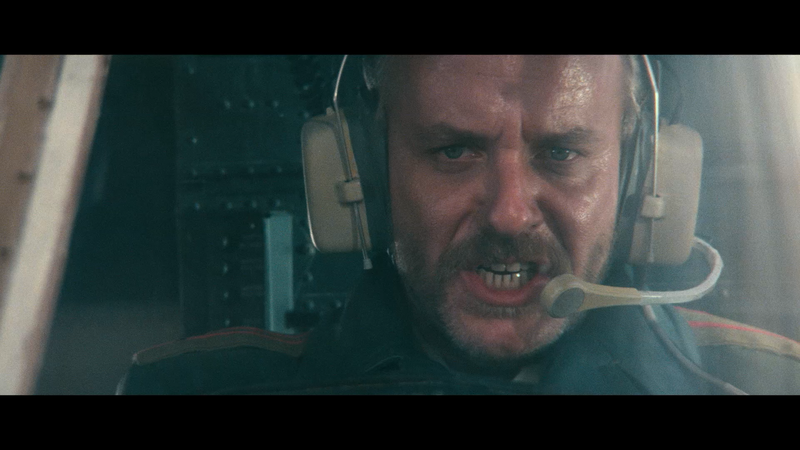 Despite all of that, it’s hard to deny there was still entertainment factor that made it mostly enjoyable but one has to chuckle that the franchise started off as a man, dealing with significant PTSD, raging war on a small Washington State town and up against the town’s ignorant sheriff… to Rambo now welcoming war up against a Russian commander. I don’t know, I realize sequels tend to ratchet it up a notch (see the Fast and the Furious or Die Hard franchises). The film was directed by Peter MacDonald who had a short stint as a director with only a few films on his resume including the awful NeverEnding Story III and a longer career as a second unit camera operator on Superman, Superman II, Rambo: First Blood Part II and Batman and now I guess works as a producer (Tango & Cash, The Quest, Harry Potter and the Goblet of Fire and X-Men Origins: Wolverine). Audio Commentary – Director Peter MacDonald provides a track delving into the specifics of the project from filming locations and working with Stallone. 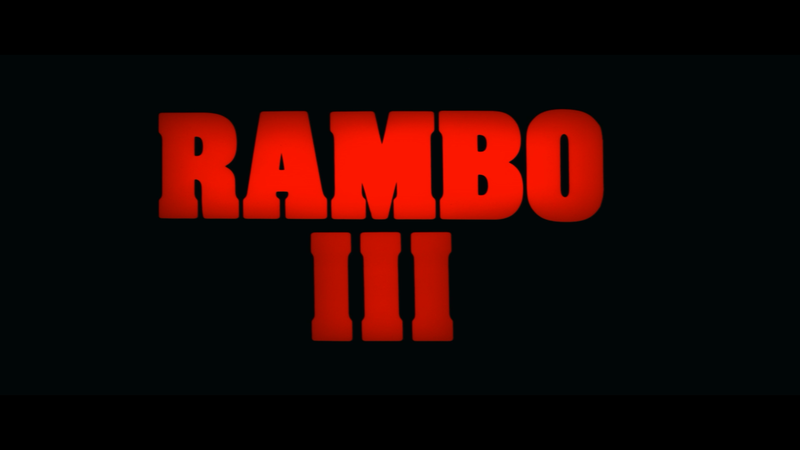 Rambo Takes the 80s Part 3 (10:47) is the final featurette this time covering Rambo III and more broadly on how the series influenced other action films. Included is more interview footage, with Peter MacDonald. An American Heroes Journey (25:29) is an older featurette covering Rambo across three films. Rambo’s Survival Hardware (8:41) looks at the tools our hero utilizes to get the job done. 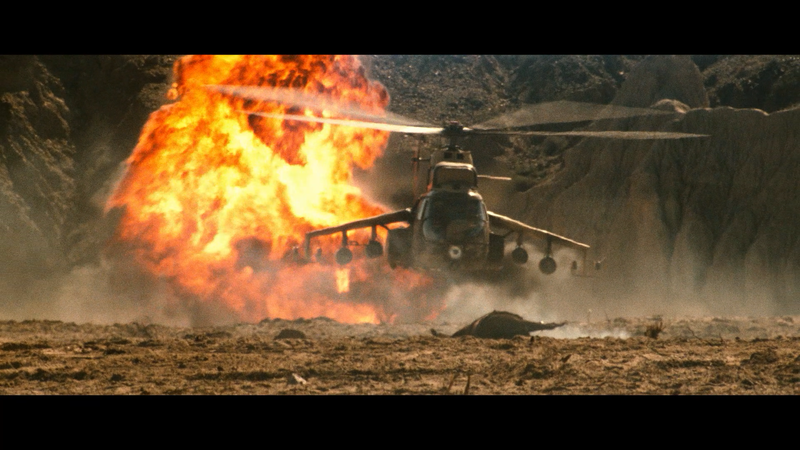 Alternate Beginning (3:37) – Just a different opening to the theatrical version, which starts the film in Afghanistan with a military convoy being attacked by a Russian chopper. Deleted Scenes (7:20) – Seven scenes here that didn’t make the final cut. Some of it are smaller character moments. Nothing that would affect the plot either way. Interview with Sylvester Stallone (8:41) from probably circa 2002, discussing the franchise and how he became involved and put his stamp on the franchise. Afghanistan: Land in Crisis (29:48) is a featurette on the country and why it was chosen to set the film. Guts and Glory (27:11) is on Rambo and what he meant for Reagan’s America in the 1980s. Behind the Scenes (6:08) – Here we get some footage from 1987/88 in this promotional featurette. The Restauration (1:21) is a comparison on how the film was cleaned up with the removal of scratches and such. Obviously this was not for the 4K transfer. Trautman & Rambo (2:32) – Promotional featurette from 1988 on the relationship between these two characters. How to Become Rambo Part 3 (15:12) is on the training regiment hosted by Stallone’s body building coach. Rounding things out is the Original Trailer (2:07) and Original TV Spots (3:18). 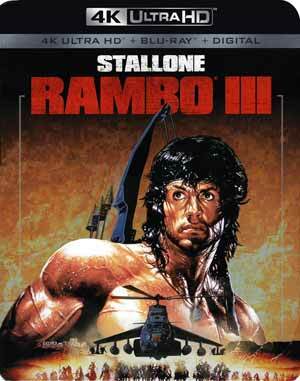 Lionsgate releases Rambo III onto 4K Ultra HD presented with a 2.35 widescreen aspect ratio and a 2160p high-definition transfer (HEVC codec). The picture basically matches the quality of the first two movies of the franchise: detail is nice and sharp throughout and colors, noticeable of course during the daylight scenes, are especially bright probably aided by HDR. Black levels are stark without appearing crushed and still being able to discern what is happening, such as when Rambo is crawling, digging his knife to find landmines. Here’s the rub. There were some every so minor specs but I only noticed this while re-watching various scenes for specifics of this portion of the review. But these were every so slight and really blink or miss it rather than distracting. The included DTS-HD Master Audio 5.1 is serviceable but also on the lackluster side. While dialogue did come through the center channel with good clarity, the action sequences weren’t terribly robust outside a few scenes, like when the Russian choppers are flying and the LFE did kick on for a slight measure of depth. Otherwise, this isn’t terribly impressive but still fine for a now 30 year old flick, though I found the tracks on First Blood and Rambo: First Blood Part 2 to be to some extent better. Overall, Rambo III is easily the weaker of the original three films of the series with the action not quite measuring up to the first two and even Stallone felt a bit wary with his performance that didn’t feel very energetic. Still, it was moderately entertaining. The 4K UHD release offers good video and audio transfers and the bonus material was halfway decent.